Yesterday we wrapped up our first week of field work for the 2015 season, and things are off to a great start (even if the weather is a little chilly). Last year we worked at four sites within ENC: Skiles Shelter, Horse Trail Shelter, Kelley Cave, and Eagle Cave as discussed in previous posts. To recap, we completed our planned investigations at Skiles and Kelley, we carried out initial testing at Horse Trail, and we got started at Eagle. Although we learned a great deal by working at four different sites, this year we will focus on one site: Eagle Cave. 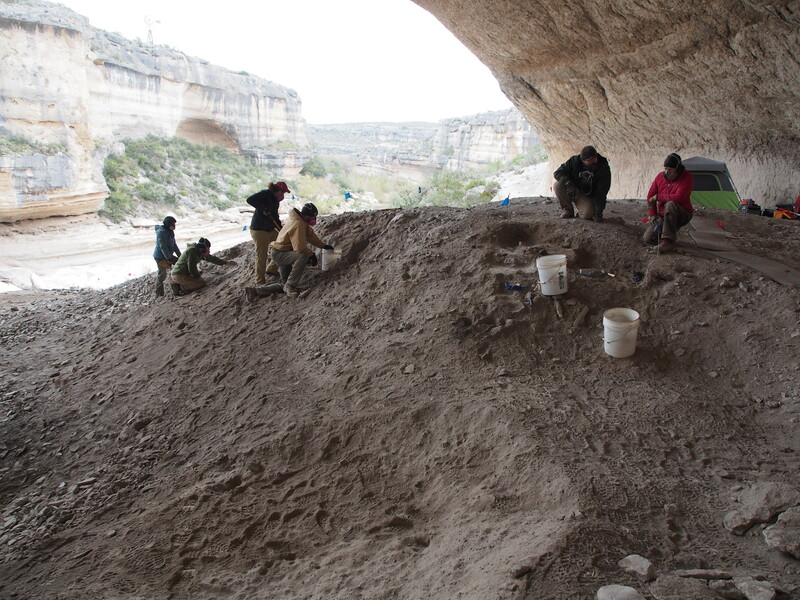 The 2015 ASWT crew, assisted by student volunteers from Texas State, begin exposing intact stratigraphy in Eagle Cave. As described in the blog post from last spring (see Eagle Cave: Where Context is Crucial), previous archaeological work in Eagle Cave in the 1930s and 1960s, and subsequent erosion, resulted in the massive trench spanning from the rear wall to the dripline. Based on the work done by the Texas Archeological Salvage Project during 1963, we know that the deposits the trench bisects are between 10 and 20 feet deep (3-6 m). Through the decades the once-vertical trench faces gradually succumbed to the forces of gravity, wind, burrowing critters, and misplaced footsteps, leaving a sloping U-shaped depression. We planned from the outset of the project to expose, sample, stabilize, and backfill the trench, but we needed to gain experience working in other areas of the site before taking on the daunting task of the main trench. Last season we opened up 5 small “windows” in different areas of the site. Profile Section (PS) 1 was on the downstream side of the site were a large badger burrow exposed surprisingly intact deposits just under the surface. Only a few meters away, PS 2 began in the disturbed deposits along the rear wall which had been dug out long ago by the Witte, the “local boys” of Langtry, and burrowing animals. As we removed the deeply disturbed rear wall deposits and worked our way outward we encountered intact remnants there too. Profile Sections 1 (left) and 2 (right). Each profile was generated using Structure from Motion software. Profile Sections 3 and 4 were located in the UT North excavation unit in the upstream end of the site (and are the subject of Tina Nielsen’s thesis research project). Profile Sections 3 (right) and 4 (left) were excavated in the UT North Unit. Excavations reached bedrock over 3 meters below surface. 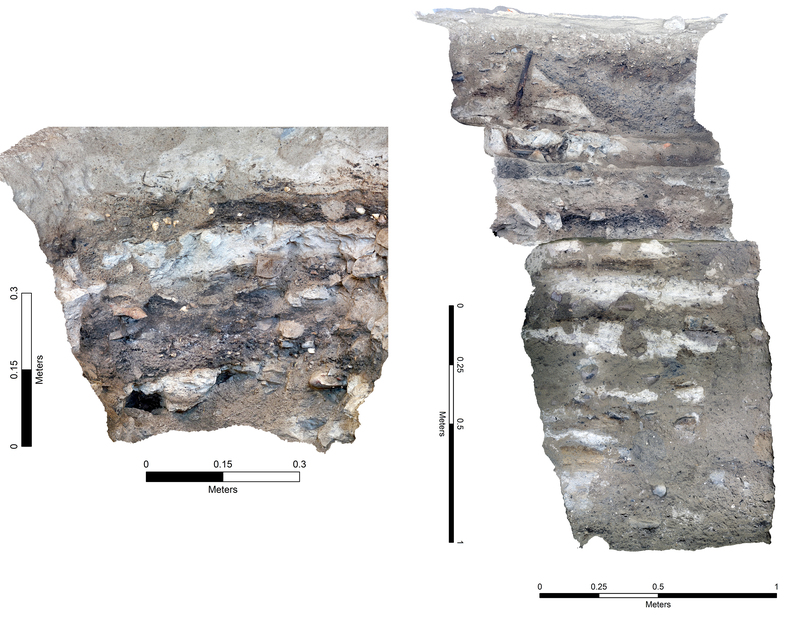 The final exposure was PS 5 – located in the upper part of the south wall of the main trench, where erosion had provided glimpses of intact layering. PS 5 was exposed on the south wall of the main trench at the end of the season. 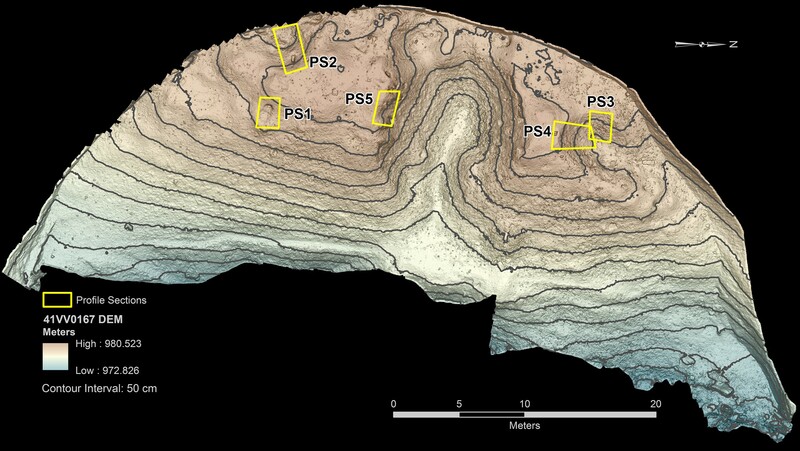 Each of these exposures (PS 1 – 5) gave us the opportunity to test, modify, and improve our excavation and sampling methods, as well as gain experience documenting the complex and fragile stratigraphy of the dry rockshelter deposits. 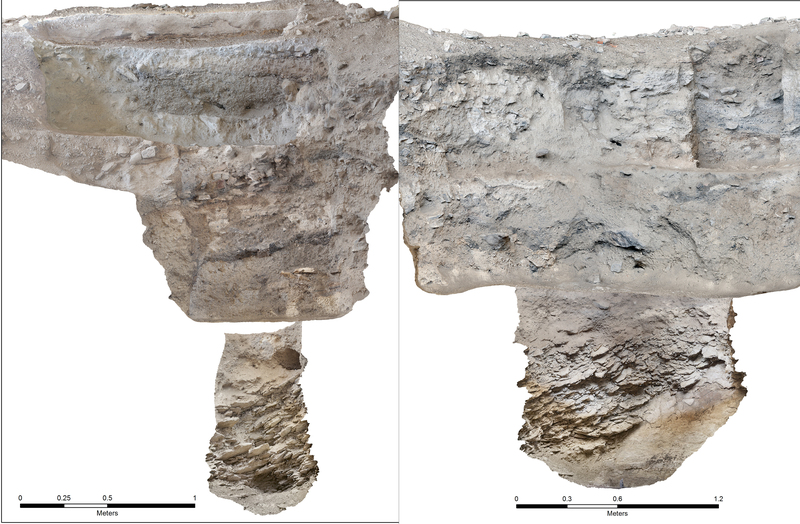 Yet, each exposure provided only a rather narrow (~3-4 feet) view of the deposits, and it was difficult to link stratigraphic layers between profiles. Our 2014 experience drove home the realization that in order to gain a better understanding of the deposits, we would need more substantial stratigraphic exposures – and there is no better place to do so than in the main trench. The focus of the 2015 field season is exposing, recording, sampling, and stabilizing the south wall of the main trench. We want to take advantage of the slumping trench wall and expose as much intact stratigraphy as we can. 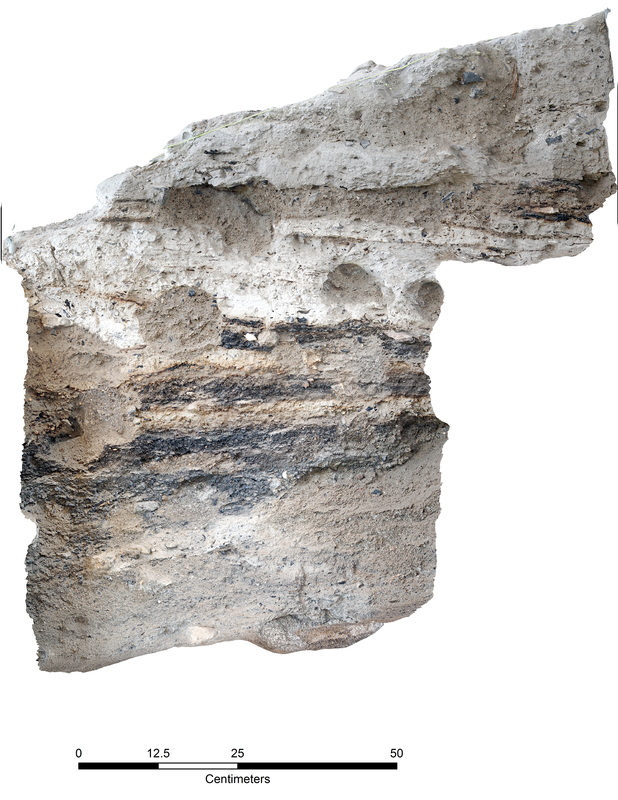 In other words, we want to frame the microstratigraphic layering seen in small windows within the context of the larger structural patterning visible across the site. We are continuing to step our profiles vertically and horizontally to maintain stability (and provide access), and we are following the same “Low Impact, High Resolution” sampling strategy (See Low Impact High Resolution). This past week we re-exposed PS 5, which we had draped with landscape cloth and gently covered with fill at the end of the 2014 season. And we began opening up fresh exposures at two additional locations along the trench (see the time lapse above). As the season progresses we will step down the exposures deeper into the trench, but for now we are focused on the upper deposits. By the end of the 2015 field season we expect that we will have documented and sampled rather spectacular stratigraphic exposures along the main trench, and we look forward to sharing what we find! Good luck on your 2015 work. I will be looking forward to your reports. My dad was one of the local laborers that helped UT in the 60’s. I still have the book that UT gave him with much of the findings of their dog. I was raised in Langtry and moved to the Lubbock area in 1966 at the age of 11. I still remember hiking through those canyons. Mrs Skiles, jack’s mom, was my elementary school teacher. Great memories.